Paul Ehrenfest (1880–1933) received his Ph.D. degree at the University of Vienna in 1904 and moved with his wife and young daughter to St. Petersburg in 1907, where he remained until he succeeded Hendrik Antoon Lorentz (1853–1928) in the chair of theoretical physics at the University of Leiden in 1912. 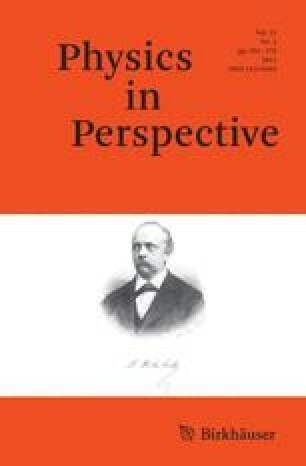 Drawing upon Ehrenfest’s correspondence of the period, we first examine Ehrenfest’s difficult and insecure years in St. Petersburg and then discuss his unsuccessful attempts to obtain a position elsewhere before he was appointed as Lorentz’s successor in Leiden. Pim Huijnen is writing a doctoral dissertation in history; the present paper is based upon his Master’s Thesis, “‘Die Grenze des Pathologischen’: Het leven van fysicus Paul Ehrenfest, 1904–1912,” University of Groningen, 2003. A.J.Kox is Pieter Zeeman Professor of History of Physics at the University of Amsterdam.